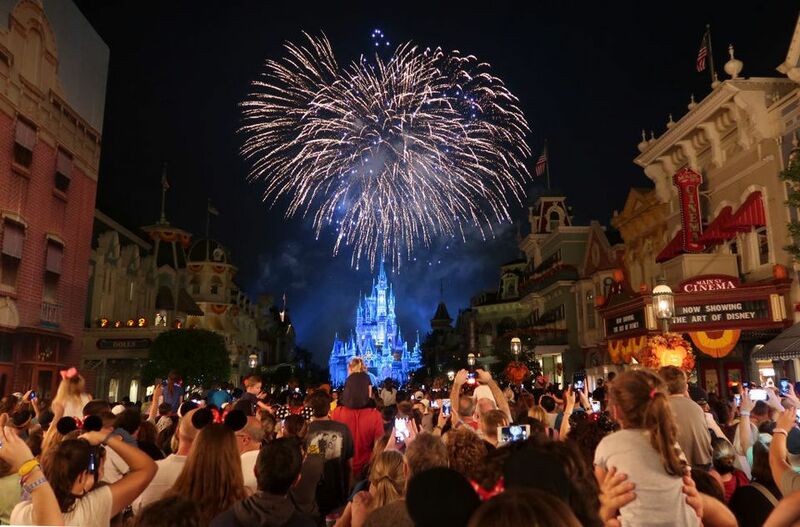 If you are thinking about a trip to Walt Disney World in Orlando, Florida, in February, you can expect favorable weather and reduced crowd levels that make this month a great time to visit with family and friends—and two major special events, RunDisney and Valentine's Day, will no doubt get your hearts pumping. Vacationers flock to Florida in the winter for a good reason: the weather. While much of the United States is experiencing freezing temperatures and snow, central Florida is comfortable and sunny during the day in January, February, and March. Expect daytime temperatures near 70 degrees Fahrenheit, but bring a warm jacket for mornings and evenings. A sweater or sweatshirt will keep you warm and comfortable most February afternoons. While the pools at Disney World's theme parks and resorts are heated to a comfortable temperature, the chillier February temperatures may keep you out of the pool, and opting for a soak in the hot tub instead. Another benefit to the cooler February weather is that it is a great time to take a baby or toddler to the parks, as they will be more comfortable, and less prone to sunburns. Orlando's February weather is pretty mild and will be quite pleasant for visitors from colder climates. Pack a light jacket or sweatshirt, along with jeans for Orlando's cooler nights—this can also help keep you warm in case of cool air conditioning in retail shops and restaurants. For park visits, shorts and T-shirts will be comfortable and are appropriate, along with sturdy, comfortable walking shoes. You'll also want to pack a daypack with a sweatshirt, sunscreen, water, and any medications or other necessities you'll need for a long day in the park. Whether you bring along the family or are planning a private couples getaway, there is plenty to do at Walt Disney World Resort in the shortest month of the year. runDisney is a top-rated event where runners of all levels get the chance to race a through the parks at full speed. There are several events held throughout the year, and in February, you can challenge yourself by running the Princess Half Marathon, or choose the shorter, but no less fun Disney Princess 5K or Enchanted 10K. There are also kids' races that allow you to run with your children, and, if running is not for you, you can try to spot your favorite Disney princesses and cheer on the athletes to victory on the sidelines. Funds raised from the event benefit the Children's Miracle Network of children specialty hospitals. You will have to visit at the end of February to experience all that the Epcot International Flower & Garden Festival has to offer, but, even earlier in the month, you will see the beginnings of the floral marvels that bring guests coming back each year. Aside from the stunning garden displays and information seminars, popular musical acts provide free entertainment on select dates during the festival. Despite being the new kid on the block, the Epcot International Festival of the Arts has already become a fan favorite among Disney fans. A perfect combination of food, art, and entertainment, this festival brings in masters in musical, visual, and culinary arts for fun presentations and hands-on workshops. Disney After Hours is a little-known secret perk of visiting in the winter months: Guests get a 3-hour exclusive experience in the Magic Kingdom. You'll feel like you have the park all to yourself, with 25 of the most popular attractions, along with character greetings, available at this after-hours event, and the best part is you won't have to wait to ride fan favorites including Pirates of the Carribean and the Haunted Mansion. If you are looking for some romance at the House of Mouse on Valentine's Day, you and your loved one can spend a memorable day at one of the theme parks followed by a romantic dinner for two at one of Disney's fine dining establishments. It should be noted, however, that even if you have restaurant reservations, expect to wait to be seated on this high volume dining day at Disney. Book your vacation for the first week of February if you want to avoid crowds. Attendance is typically low the first week, but it rises steadily throughout the month. President's Day crowds are expected to start the third week of February, so make sure to read up on the FastPass+ system before your trip to cut down on the ride lines. However, compared to the high season months of July and August, February is significantly less busy. A small downside to Disney travel in February is that some park hours may be reduced early in the month due to lower crowd levels, so your late night choices may be limited to a single theme park, but given the freedom of short wait times, the tradeoff is often worth it. It's no secret that Disney offers some great snacks and beverages. So, while you may not want to sip something piping hot in July, February is an ideal time for a warm, comforting drink, or to savor an ice cream treat without it immediately melting. February is also an ideal time to get your favorite (tiny) princess a Bibbidi Bobbidi Boutique makeover, or a haircut at the quaint Harmony Barbershop. Not only will your little one have a blast, but the makeover will last longer since you will most likely not be hitting the pool each day. If you have never tried some of Disney's outdoor activities such as biking at any of the resorts, or horseback riding at Fort Wilderness, consider adding something healthy and fun to your schedule. Your chance of an unwelcome reptile or insect encounter drops dramatically in the winter. To learn more about when you might want to book a Disney vacation, check our guide to the best time to visit Walt Disney World.